NT Thunder Football Club is delighted to announce Darren Reeves as NT Thunder Head Coach for the senior men’s team for the next two seasons. A highly regarded coach with a Level 3 AFL High Performance certificate, Reeves has over eight years of senior football coaching experience and was most recently the Senior Assistant/Reserves Coach at Central Districts Football Club in the SANFL. From 2015 to 2017 he was Head Coach of the Centre of Excellence for the Central Districts Under 18s team which proceeded the 2015 premiership he won with the Nuriootpa Football Club in the Barossa & Gawler Football League. Hailing from the Blue Mountains in NSW, Reeves was a gifted junior football, cricket and rugby league player. He was a NSW state representative cricket player from Under 17 to Under 21 and was given an AIS Commonwealth Bank Cricket Academy scholarship in 1997. He will now become the sixth head coach of NT Thunder going into the club’s eleventh season. 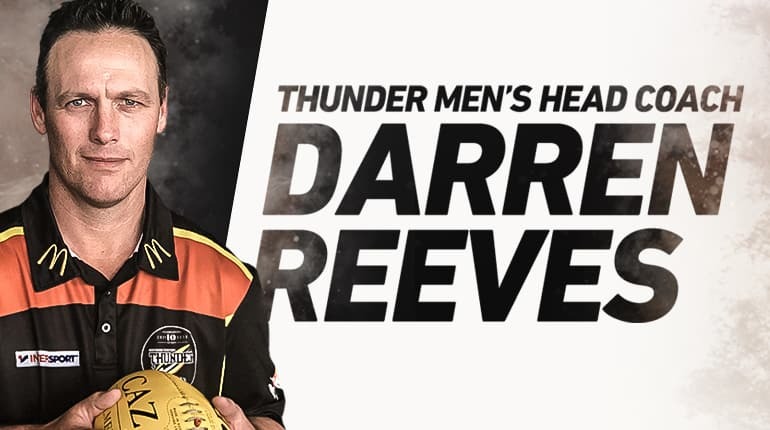 Reeves said what attracted him to the NT role was his desire to take his coaching to the next level by being part of an elite environment and the exciting style of footy he’d witnessed Thunder play. “I want to become the best coach I can, and with all I know about the NT Thunder and AFLNT program, I know this is the environment to do just that. It will be a privilege to work with elite, talented players every day. “I have been watching NT Thunder and keeping up with the NTFL and CAFL for the past couple of years, and there really is a ‘Territory style’ of play that I think is unique. In the coming days I look forward to meeting the leadership group and the rest of the players, learning more about them and sharing back my coaching philosophies and ideas,” Reeves said. AFLNT CEO Stuart Totham, who was part of the selection process, said that Reeves was the standout candidate from the applications received. “Our preference is to find a local product to fill domestic roles, and we did our due diligence to explore every opportunity to enlist a talented local coach with the right skills, but unfortunately it didn’t work out. “However, right through the process Darren was a clear front-runner, and his knowledge and understanding of Territory football were second to none. “The other positive is that he is committed to mentoring and assisting local coaches in continuing their pathways with the NT Thunder and AFLNT talent program, with a number of our current NTFL coaches earmarked to continue their involvement with the club,” Totham said. NT Thunder Manager Andrew Hodges said he was confident Reeves would build strong relationships with the players, support staff and wider Territory footy community. “Darren is the right man to lead our club forward. Throughout the extensive selection process, it was evident his values and behaviours are very closely aligned with what NT Thunder stands for. “Darren is very well regarded within the AFL industry, and we can’t wait to get started,” Hodges said. Reeves will be present for the first NEAFL pre-season training session next Monday 3 December where he will meet some of his players.